A Film Screening of Peter Brook’s “Meetings with Remarkable Men” followed by a discussion with Mumbai Seekers. Meetings with Remarkable Men is a 1979 British film directed by the legendary Peter Brook and based on the book of the same name by Greek-Armenian mystic, G. I. Gurdjieff. 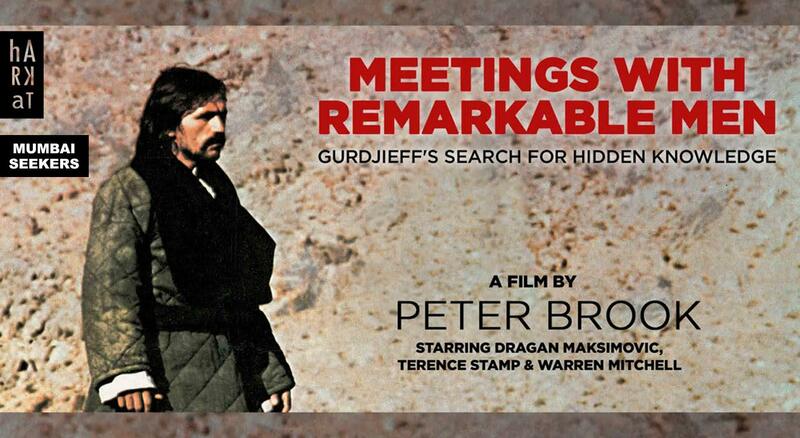 Shot on location in Afghanistan and England, it stars Terence Stamp, and Dragan Maksimović as the adult Gurdjieff. The film was entered into the 29th Berlin International Film Festival and nominated for the Golden Bear. The film has a cult status especially among the Esoteric Circles because of the scenes showing Gurdjieff's initiation into the mysterious Sarmoung Brotherhood and the public some glimpses of the Gurdjieff movements – the sacred dances taught in ancient temples. However it is believed that, Mme Salzmann (Gurdjieff’s successor) was personally involved with the film and that the teachings of Gurdjieff has been subtly embedded in the film and a conscious watcher will find insights leaping out of film at specially arranged places.